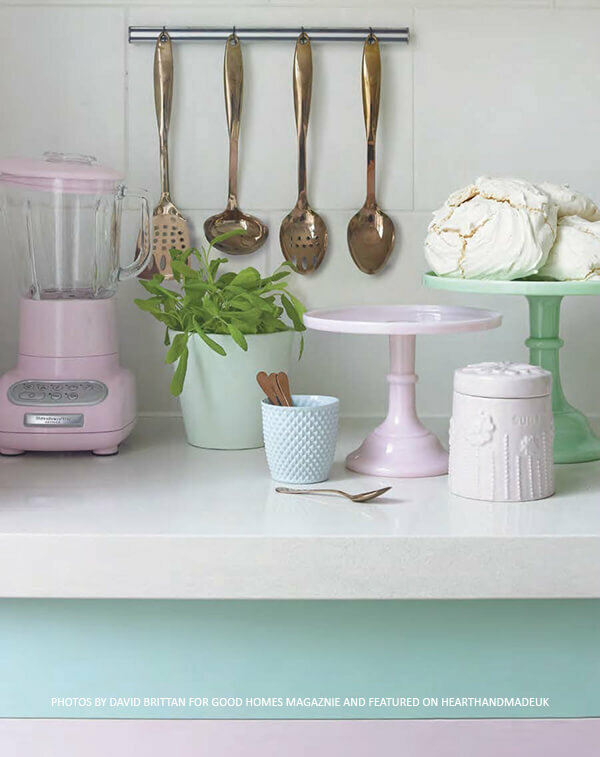 You guys know me, it’s very easy to tell what my favourite colour palette is from the style of my blog.. so when I saw this pastel kitchen full of the most amazing pastel coloured kitchen pieces and adorable little jars with stickers, I had to share it with you! It got me thinking of how I managed to make my kitchen ‘pastel’ except for the cupboard doors (I live in a rental). I’ve made up a few rules, there was one rule actually – all storage and electricals had to be cream. Then small bits and pieces, plates and other items were pastel shades etc. BUT now I do want an aqua kitchen aid and pink mixer so don’t make your own rules too strict (you might regret it a few years later!). 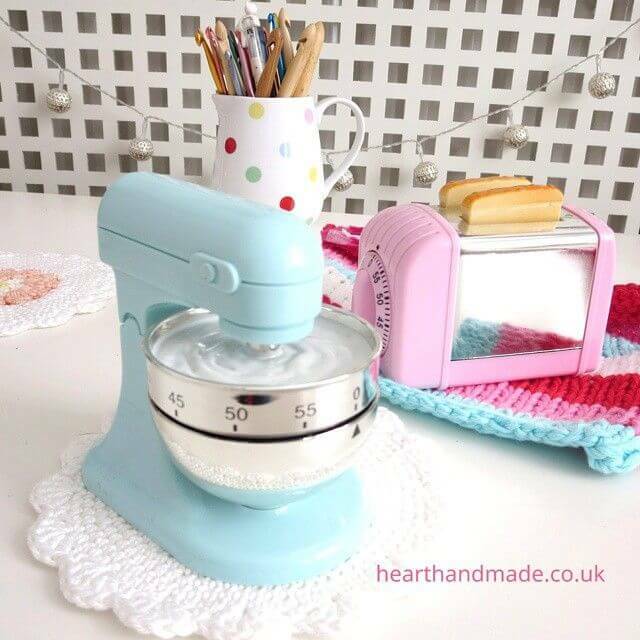 From this photo, I want to paint my cupboards in pastel shades and I want that kitchen aid blitzer! Stuck for thoughts on how to choose your colour palette? 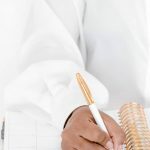 Check out a site like Design Seeds to get inspiration! Think about customising your furniture – could you paint your chairs or table? You could paint your kitchen cupboard doors, there are plenty of tutorials on pinterest. I even saw a tutorial that shows you how to paint your fridge! The world is your lobster! (I know the world is your oyster, but that’s my new favourite phrase. It’s an egg corn I heard on the adam and joe radio show). examples: “curled up in the feeble position”, “the pot calling the kettle back”, “don’t lead me on a wild goof trek”. Some of them are hilarious ^_^ I went on a tangent there didn’t I? Back to the pastels! Consider replacing your electricals! This can be very very expensive. 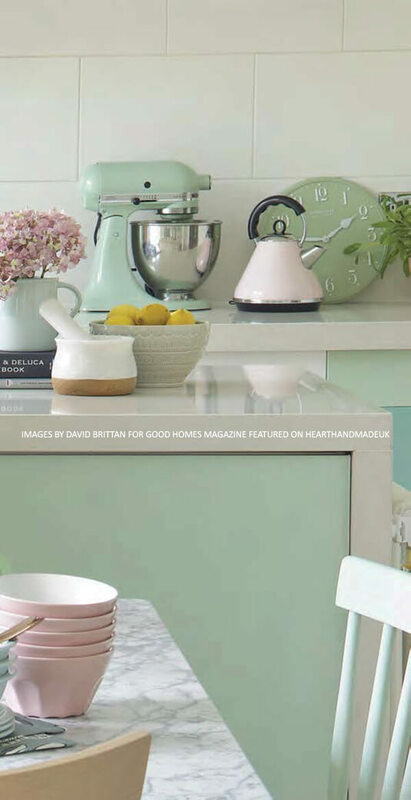 If you are patient… in a few years your kitchen will be a pastel paradise. I replaced my electricals one at a time. At Christmas and Birthdays I always asked for things I wnated for my kitchen (all reasonably priced of course). My favourites: The Candy Range from Dunelm. Decant your tea’s, coffee and sugar into little jars and put them on display! You can buy the most visually stunning jars and these stickers. Decanting items from packages makes your kitchen look a little more uniform. 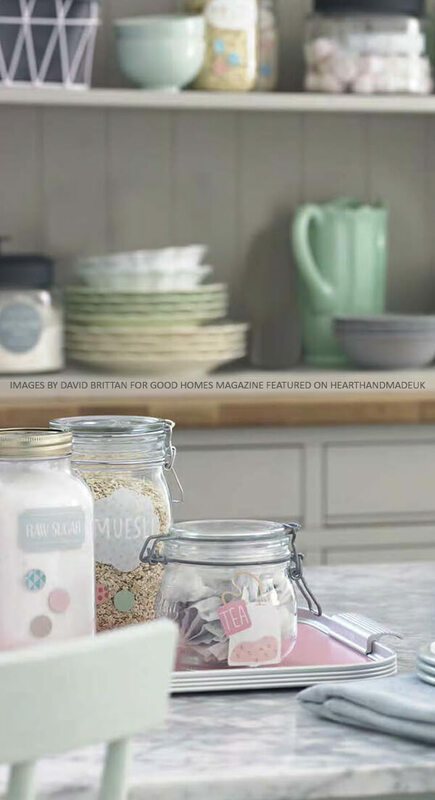 Products in lots of different packaging on display can be very distracting to the eye and a uniform colour scheme and set of jars can really make a huge difference to how your kitchen looks. 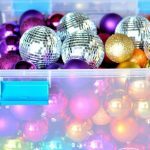 Be Strict with your colour scheme – once you start introducing darker shades and bright colours it messes with the pastel palette and isn’t as visually striking. 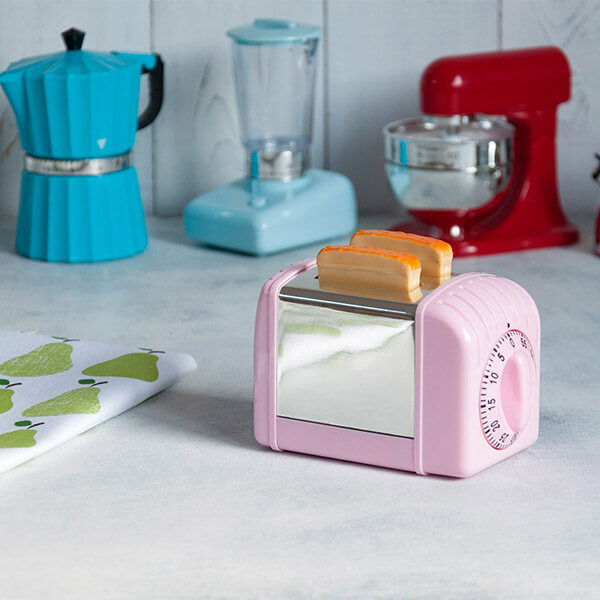 I’ve found some fabulous budget friendly accessories you can start buying to build up your pastel kitchen paradise! 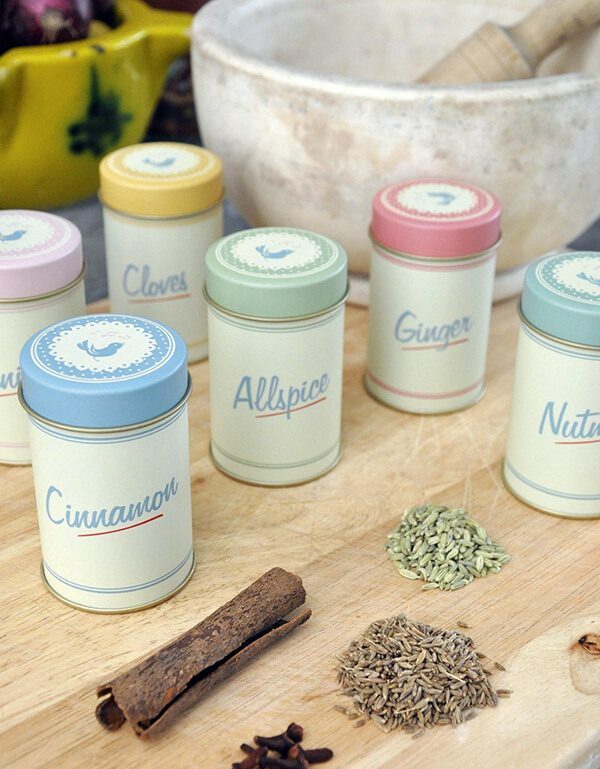 Pretty Pastel Spice Tins (you can get cashback from dotcomgiftshop if you’re registered with topcashback). I would love to buy these but I have about 18-21 Spice bottles at the moment and none of them are allspice or cloves! 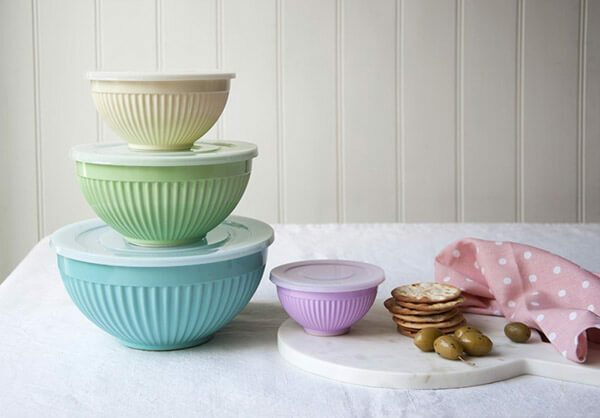 These Rice DK inspired melamine storage tubs are perfect for my kitchen and they look fabulous! O_O I want these. I might go into my kitchen and break the old kenwood ones I own. ‘Oops! what a terrible accident! 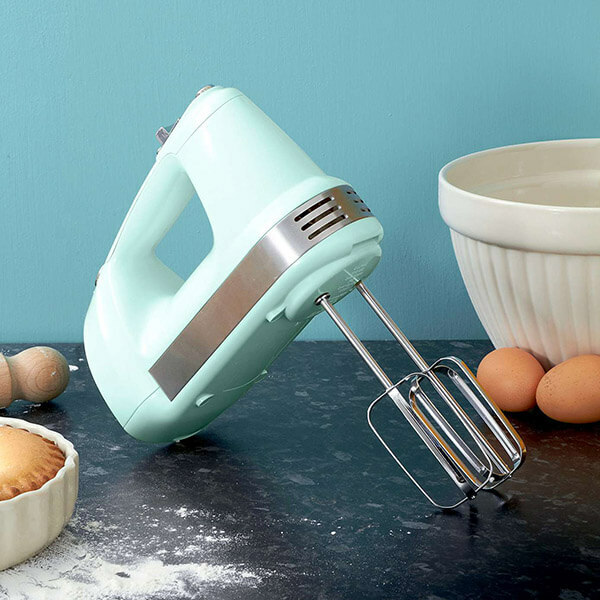 Oh noooooooooo’ I LOVE this mint whisk! I wonder how it would cope with cookie dough. They’re soo pretty. This is basically how all of my electricals look – all clean and cream and lovely. 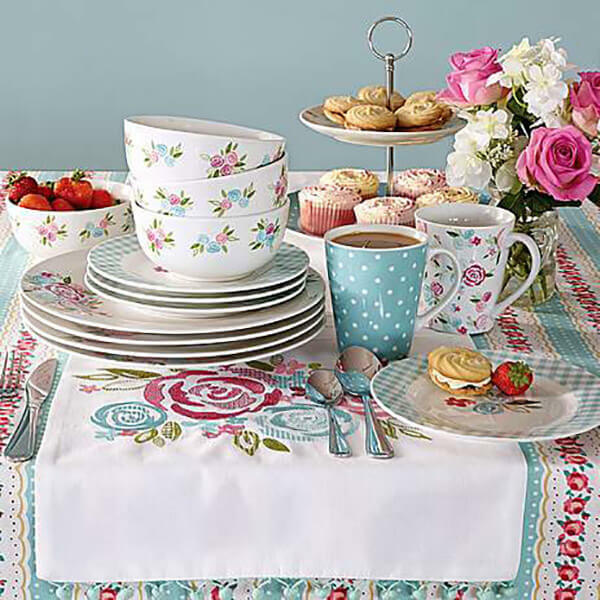 The candy rose dining set is gorgeous! I own one of the bowls and a lot of the bathroom range. I’m a little obsessed with this range. 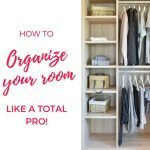 The best part though – budget friendly. 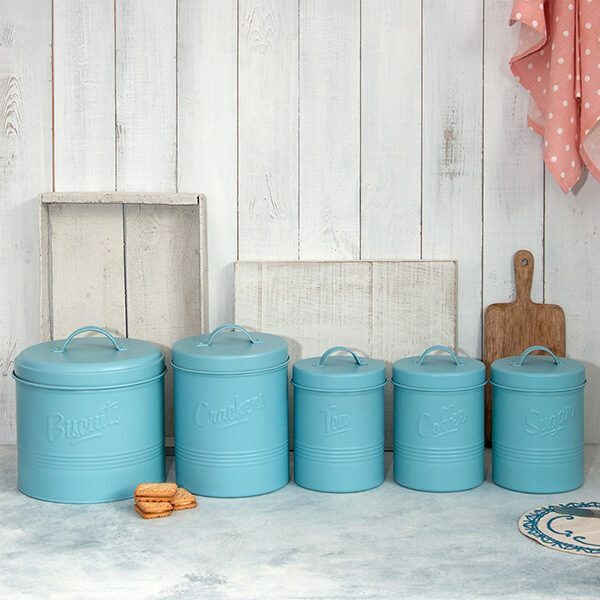 This forties style kitchen storage range is rather fabulous but I think I would love it in a seafoam green colour. At present it’s only available in this shade of blue. 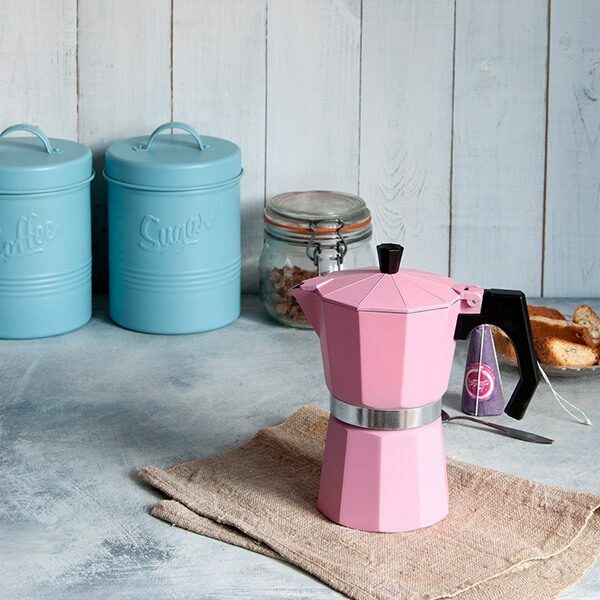 I love coffee and quite honestly I would love an espresso pot in every single pastel shade they have to offer! Good luck with your pastel kitchen quest!! 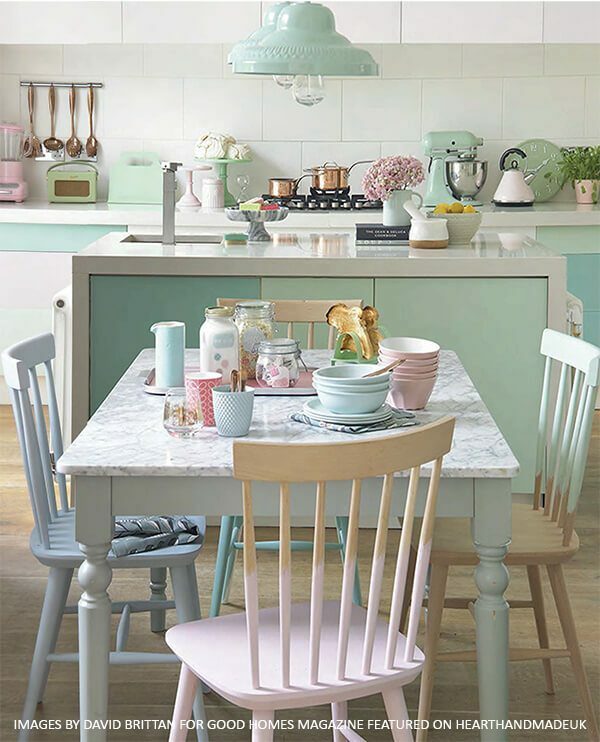 If you LOVE pastels you might like to see Kate Gabriels kitchen! 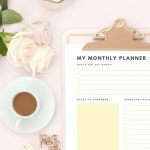 If you liked it, I would appreciate if you would be amazing and share it on social media! Mention me, I’d love to connect ^_^ @hearthandmade on IG @hearthandmadeuk on Twitter. lol! Yeah I think most men would. Luckily my man is so laid back he’s almost horizontal so if I ever buy a house my kitchen is guna be pastelly fabulous! Oh my word, I have died and gone to heaven. I have always had trouble deciding what my favorite kitchen theme would be and thought it was “southern country” but in my mind I was actually picturing this! It is the perfect blend of soft and subtle tones without feeling overly feminine! I adore your counter tops! 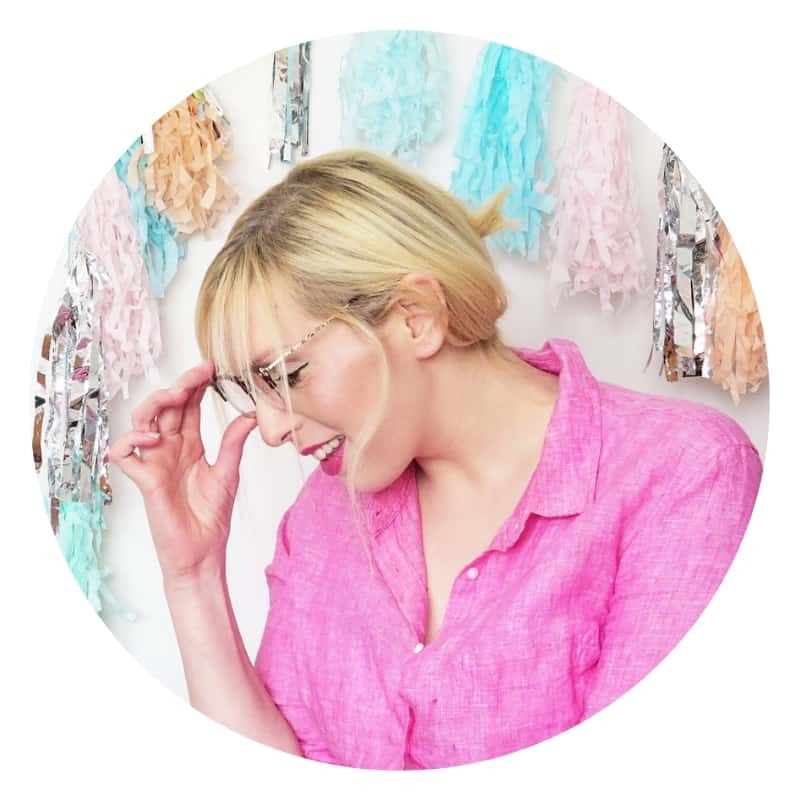 Yeah I didn’t realise how much I loved pastels until I was creating a moodboard for my blog designer! 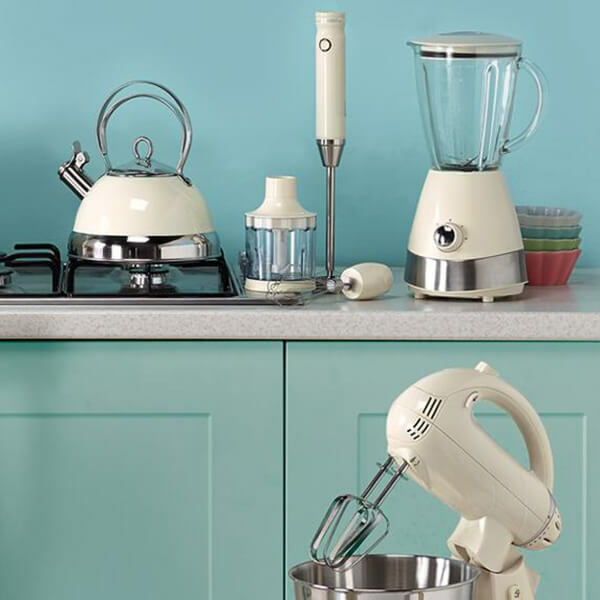 I personally like my colours loud but I really do love this kitchen, especially the kitchen aid mixer I have always wanted a colour one as mine is chrome which is rather boring. I have always been partial to miss matched chairs too which are what I love most about this kitchen. Thanks for sharing this! This post couldn’t have come at a more perfect time. 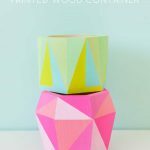 My kitchen is going to be pastel and I love these ideas! Especially that mint whisk. Thank you for the inspiration! Absolutely LOVE your kitchen! You really have the knack. We are trying to figure out how to update our kitchen and yours is so inspiring! This is such an amazing idea! Thanks for sharing it. I’m Anita visiting from Creative Ways Link Party.